The MEANDMYGOLF team perform another challenge for their Commonwealth games on a FlightScope golf launch monitor. This time they do the Happy Gilmore and run up to the tee before hitting their driver shots. Click here to watch their first challenge in which they use the “hammer” method to hit their shots. 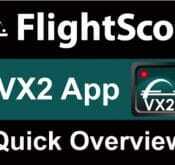 The pair recently did some creative skills challenges on FlightScope’s VX2 application. In this challenge they emulate a hammer thrower on the tee and use FlightScope’s golf ball tracker to determine the winner. MEANDMYGOLF’s website has some great instructional content and their Youtube channel is very entertaining. Follow the link below for some more FlightScope videos. The MEANDMYGOLF team challenging each other on the VX2 application. A video demonstration of the VX2’s capabilities. Features such as video analysis, club comparison and D-plane visualization are discussed.